Your outdoor pizza oven doesn't need to be a permanent structure. We review one of the best alternatives. Looking for an outdoor pizza oven? Here's an ingenious low cost alternative to a whole new backyard structure : a kit to transform your kettle grill into one of the most effective ovens you'll ever see! Have you ever watched those films about Italy, and wished you too could have pizzas baked in a wood burning oven, in the warmth of an Italian sun? Well, now you can! Maybe not in the warmth of an Italian sun, but certainly in the comfort of your own backyard. Making a permanent brick-built backyard pizza oven is a costly and time consuming business. But if your dream is to have some amazing-to-taste pizzas without the expense, this is a great option for you. It's a very simple piece of metal which, after some easy assembly (you don't even need a screwdriver!) 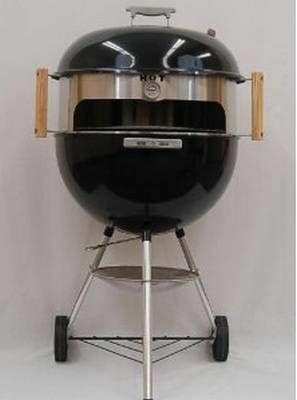 inserts into your wood or charcoal-burning kettle grill and transforms it into an oven. It even comes with its own dish to help you start making delicious pizzas straight away! It basically creates an oven in the centre of your kettle grill by inserting a rounded piece of metal onto the base and fitting the lid on top. It's made of stainless steel which heats very quickly and, because it's enclosed, it keeps the heat where it needs to be - cooking you a delicious pizza in a matter of minutes. And because you don't need to open the lid to take the pizzas out - you use a slot in the centre, just like in traditional outdoor pizza ovens - it stays hot enough to put your next one in straight away. Everyone who has used it reports that it makes the most delicious pizzas. The bonus is that you can cook while you're sitting chatting to your guests. No more running back and forth to the kitchen! 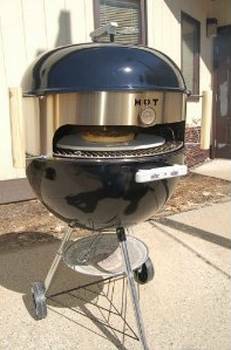 Does this outdoor pizza oven kit have any drawbacks? 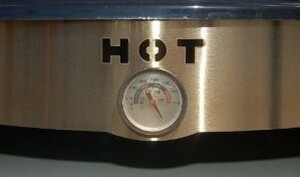 People who use it report that it can be difficult at first to gauge the heat level. It rises very quickly within the metal casing and that can mean burnt crust for dinner! Although there's an integral thermometer it only measures to 700 degrees, and you'll find the wood or charcoal getting far hotter than that. It's just a question of trial and error. You'll learn very quickly exactly how much fuel you need to make the most delicious pizzas you've ever tasted. 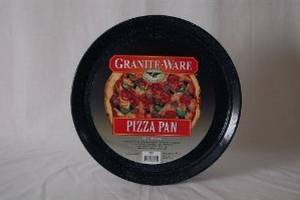 For best results, use with a traditional pizza stone. You can buy a more expensive kit which includes a stone, but it's actually less expensive to buy this kit with a separate stone. Yes! Just as we use our traditional backyard pizza oven to cook meat and fish, you can do the same with this. It will give your dish a beautiful, wood-smoked flavour. Solidly made - will last for years! Cooks pizzas to perfection, with a traditional Italian taste. Crusts are always crisp and firm. Anywhere your kettle grill goes, this can go too! No more than five minutes cooking time per pizza. Gives that 'just a bit out of the ordinary' backyard party! Also cooks meat and fish without drying out. Danger of burning until you get used to how quickly it heats. If you want more evidence of just how good this is, click on any of our larger images to go to Amazon and see what people who already have one say. Thinking of making your own pizzas but not sure where to start? Have a look at our tips for making tasty Italian pizza dough. easy pizza dough recipe just for you!